Kentucky Trial Lawyer Frank Mungo has trained the very best national trial lawyers on mastering voir dire. This members only seminar will be a half day event, part lecture – part workshop, that will take your jury selection skills to a new level. Frank M. Mungo is a criminal defense/DUI and plaintiffs trial lawyer who practices in Kentucky and Ohio. He consults nationally with trial lawyers to help master jury selection and to uncover the emotional cores of their cases. Mungo is an instructor at Gerry Spence’s Trial Lawyers College in Wyoming, and an adjunct professor at Salmon P. Chase College of Law. He has degrees in physics, aerospace engineering, and mechanical engineering. As both a scientist and a lawyer he has a demonstrated ability to use the power of science to win arguments (and cases). Mungo was IAJ's top rated presenter at the 2018 Annual Convention, where he spoke about “Telling Compelling Stories Through Cross Examination.” He's back by popular demand for this Members Only Seminar; it will be one part lecture – one part workshop, and 100% jury selection. 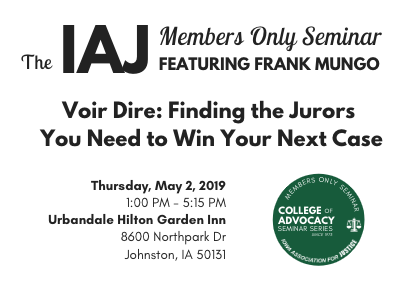 Registration: Available only to those who have paid 2019 IAJ dues, or who join IAJ before or at the seminar. All attendees must qualify as IAJ "regular members," meaning that over the last 12 months insurance defense work does not make up a majority of their individual practice in terms of practice time, caseload, or income. IAJ law student members are welcome to attend this seminar (if they are clerking for a "regular member" of IAJ). Seminar Materials: All seminar materials will be accessible online immediately prior to and during the seminar at no charge to registrants. Printed materials will also be made available as needed. Case Workshop: Request a practice area expert to spend an hour, one-on-one at the seminar, talking through a case. This service is free to IAJ members. For questions, or to sign up, contact IAJ at info@iowajustice.org. Click here to reserve your room at $126.00. April 26 deadline, subject to a $25 administrative fee. Cancellations will be accepted through April 26, subject to a $25 administrative fee. Requests for cancellations cannot be honored after April 26, but materials will be mailed or a substitute may attend.